This is one of the projects I finished during my “blog-goes-dark” months. As soon as I saw this fabric I just HAD to have it. Full Price? Not a problem. Weird Heavy Drill Fabric? Don’t Care. Probably not the best colours on me? Still don’t care. 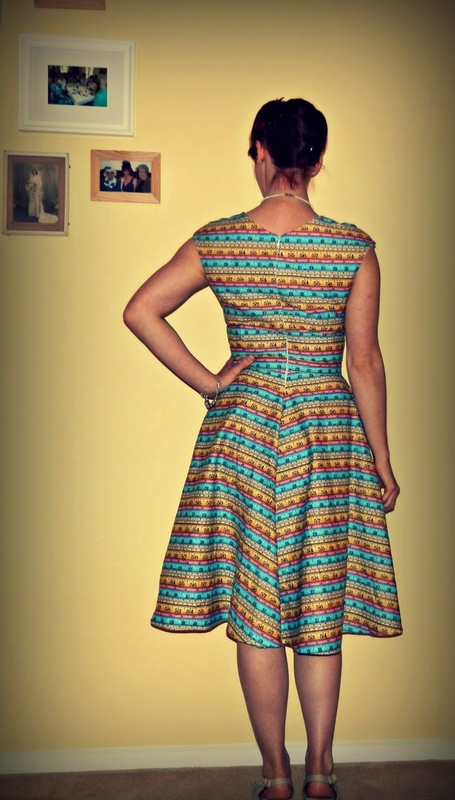 I should also point out that I f*cking love this dress. Literally so much love it has to come with swearing because this is awesome! Also there is a LOT of goober face in these pics as they were taken on timer after a long night out but sorrynotsorry I’m not taking more so this is the best you get. 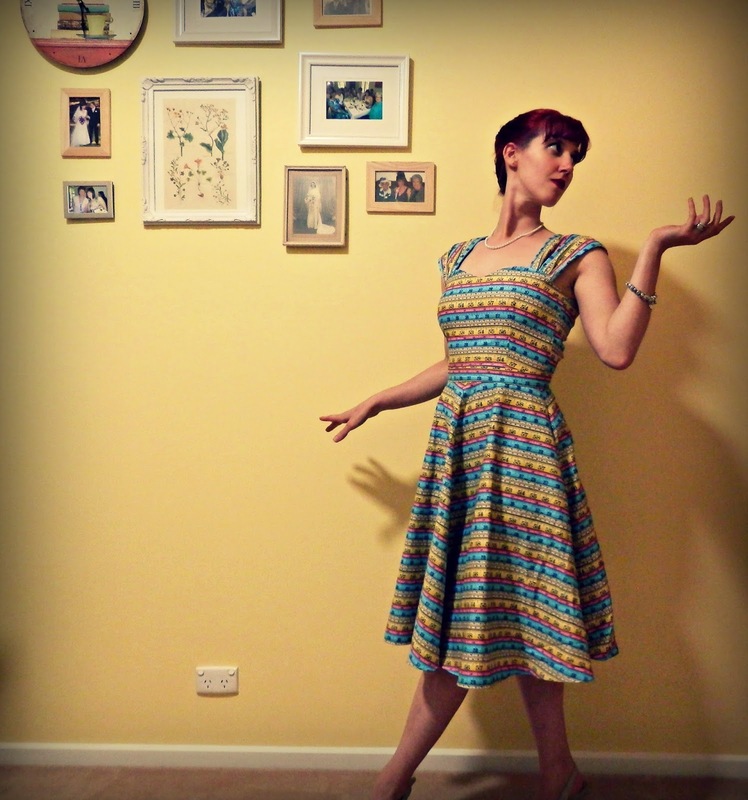 The bodice is the Sewaholic Cambie Dress in a size 6. I add about 1.5cm to this size in the side/back seams since the Cambie is really designed for pear shapes and I’m definitely not one of those! I could probably do a Full Bust Adjustment but I’m lazy and on me this simple add makes all the difference I need so why get fancy if I don’t need to? 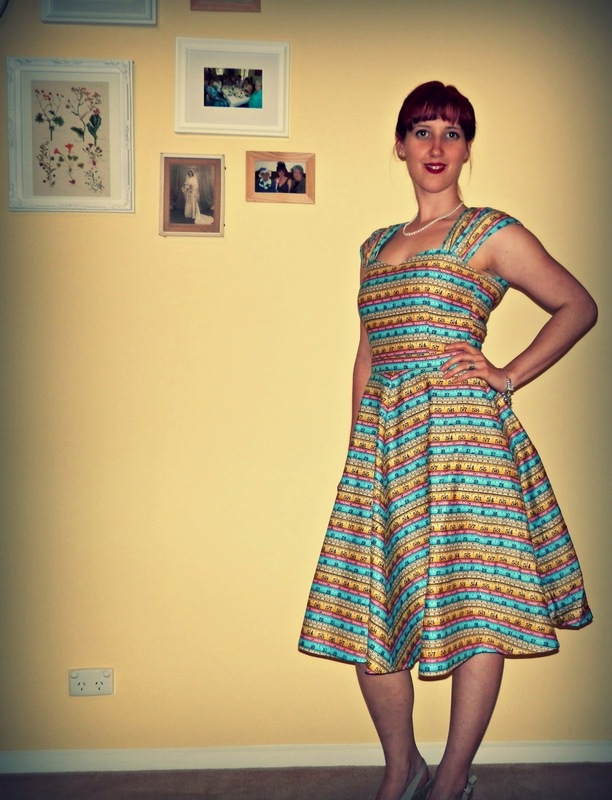 I changed out the gathered Cambie skirt for the semi-circular one from Vogue 8615 including pockets! Now all my ready-to-wear dresses feel like they lack pockets cos I just love having them in everything I wear sooooo much. The fabric is from Spotlight of all places and seems to be some kind of novelty cotton drill. It’s quite heavy and has a lot of body so I thought the sleeker circle skirt would be more flattering than all those gathers in the original Cambie. Bonus side effect? The heavier fabric means the interfaced waistband holds its shape beautifully, whereas past versions in cotton lawn have tended to roll in at the waist even with interfacing. 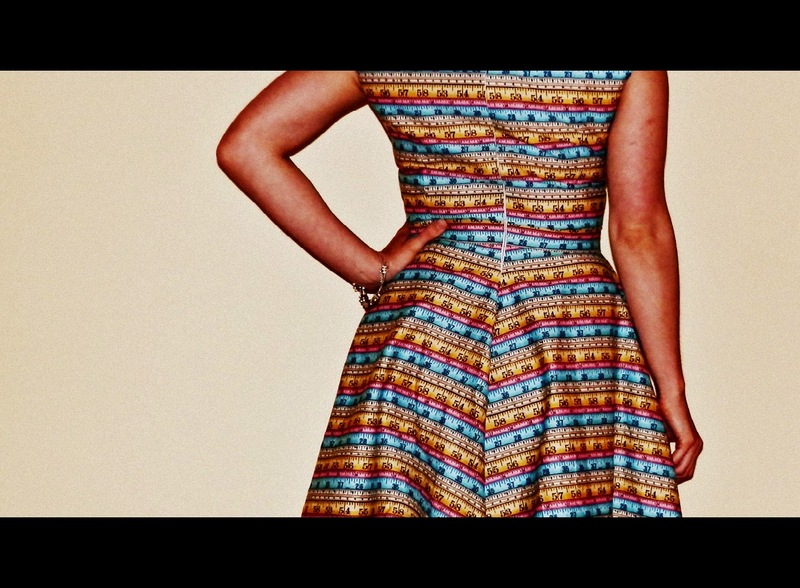 The downside is there isn’t a heap of stretch in the fabric so no big meals in this dress. Plus I’ve already had to repair the sleeves after ripping them bowling at my work christmas do. But how could I not wear this dress bowling? Such a cute 50’s vibe right? The bodice is lined in pale pink cotton lawn and the skirt portion is unlined to save on weight since this fabric is quite heavy. Construction wise there isn’t much more to add – I just love how fun and ridiculous this dress is! Bought even more fabric today – I seriously have a problem, maybe someone runs a fabric rehab somewhere I can go to? Will just have to get sewing again I guess… Good thing the sewing room has aircon in this heat!